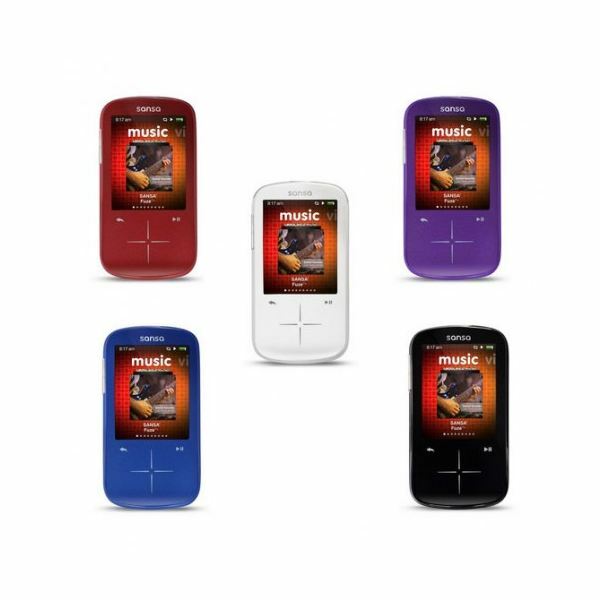 Sansa View MP3 player expands the credit card sized Sansa Fuze screen size of 1.9" and 8GB storage capacity while retaining the Fuze's high end digital media performance features. The View's functions are controlled by the home button and the thumb wheel ring on the front and a power slide bar located on the side. 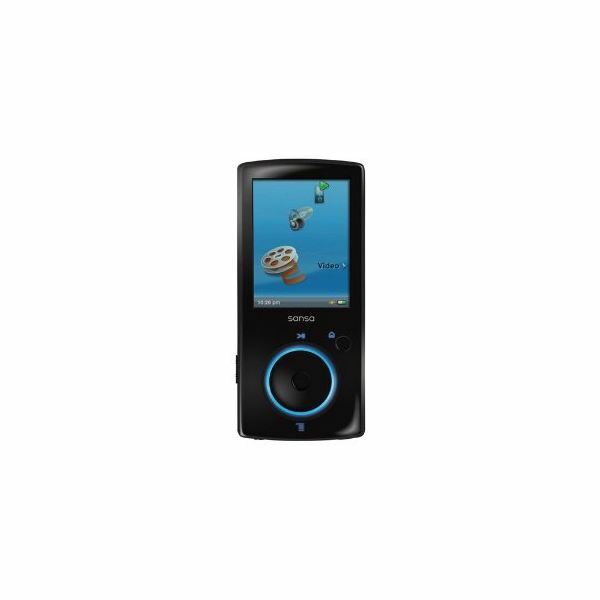 Fuze and View both have slots for accepting blank micro SC/SDHC cards and a loaded slotRadio or slotMusic card. Sansa Fuze dimensions: 2.1 ounces; 3.1 x 1.9 x 0.3 inches. The Sansa View dimensions: 8.0 ounces; 4.29 x 1.95 x 0.35 inches. Available in Black only. The Li-Ion battery provides 35 hrs audio, 7 hrs video. Charges only when the computer is powered on, requires at least 3 hours to charge new and then 1.5 hours to recharge. Also may be charged using the optional SanDisk AC wall plug or vehicle charger. 8GB ($119.99) – up to 2,000 songs, 4,800 photos, and 24 hrs. video. 16GB ($174.99) – up to 4,000 songs, 9,000 photos, and 48 hrs video. 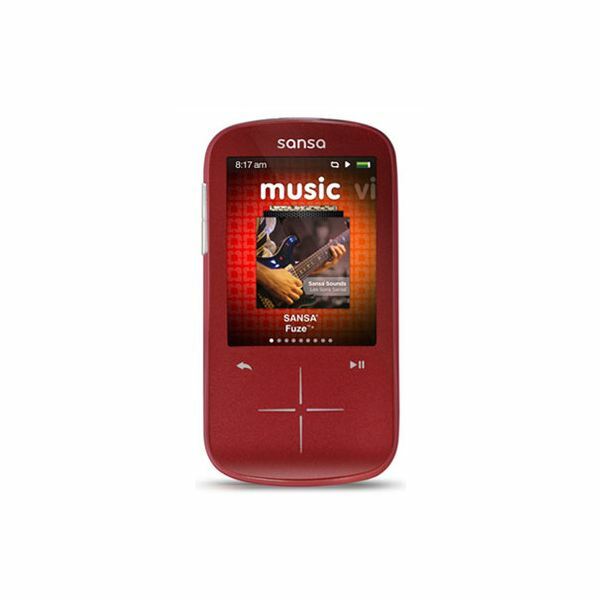 32GB ($214.99) – up to 8,000 songs, 19,000 photos and 96 hrs video. Corporation launched the Sansa Fuze+ (plus) as the successor to the Sansa Fuze. The new Fuze+ does more than expand the previous model's storage capacity, it is a complete redesign of form and function of the Sansa View with the compact dimensions of the Sansa Fuze. The Fuze+ expands the visual enjoyment by giving users a larger screen, the smooth feel of GUI touch pad navigational controls, as well as a greater storage capacity. Compatible with Windows, Mac OS and Linux operating systems. Available in white, red, blue, purple and black. Sansa Fuze+ dimensions: 2.25 ounces; 3.82 x 2.02 x 0.43 inches. Battery life: 24 hrs audio, 5 hrs video. 4GB ($79.99) Black, Blue and Red. Stores up to 1,000 songs, 2,400 photos and 12 hrs video. 8GB ($89.99) Black, Blue, Purple and White. Stores up to 2,000 songs, 4,800 photos and 24 hrs video. 16 GB ($119.99) Black. Stores up to 4,000 songs, 9,600 photos and 48 hrs video. Music: plays MP3, WMA, secure WMA, OGG-Vorbis, FLAC, AAC/M4A, (DRM-free iTunes music files), WAV, Audible (AA), audiobooks and podcasts. Seamless synchronization with Rhapsody, eMusic and Napster. Drag and drop music transfer from Window Media Player, from a Mac music folder or from the player to a micro-SD card. Create a "Music To Go" playlist in 2 seconds of any music currently playing. Integrated FM radio, saves up to 40 pre-set channels, enables recording of live-broadcast FM radio stations, pausing of FM broadcasts during recording to filter out commercials and other unwanted broadcast portions. Voice recordings with built in microphone. Ability to store multiple independent recordings. Plays MP3, WMA, secure WMA, Audible (AA), audiobooks and podcasts in MP3 file formats. Music submenu displays: play all, recently added, artists, albums, songs, genres, my top rated, playlists, podcasts, audiobooks, recordings (voice), folders, Rhapsody channels. Drag and drop music transfer from Windows Media Player, Mac computer or from player to micro-SD card. Integrated FM radio, programs up to 20 pre-set channels. Voice recordings with built in microphone, voice files stored in WAV format. Video files supports H.264, MPEG-4, WMV, in addition to 3gp/3gpp2, ASF, AVI, DAT, DivX (ver 6.0), DVR-MS, MOV, MP4, MPEG 1, MPEG 2, MJPEG, FLV and Flip file formats require the use of the optional free Sansa Media Converter (SMC) download. Photo file support for JPEG and BMP formats, the optional free Sansa Media Converter allows additional formats of TIFF, GIF, PCX, TGA, and PNG files. 2.4 in. LCD screen color screen with 320 x 240 resolution. 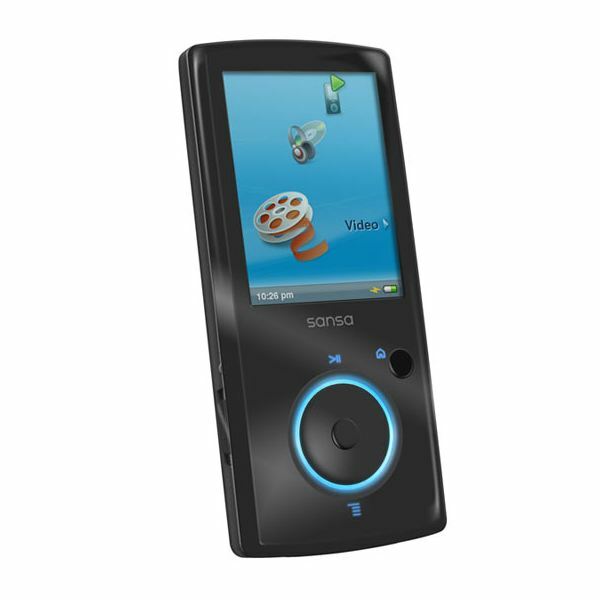 Video compatible with MPEG4, WMV and H.264 and other video formats via the Sansa Media Converter. Photo JPEG files supported and other files transferred via the Sansa Media Converter software. Sansa Fuze, Fuze+ and View accept the SanDisk slotRadio cards ($39.99) that contain approximately 1,000 top Billboards hits from a single artist or group. 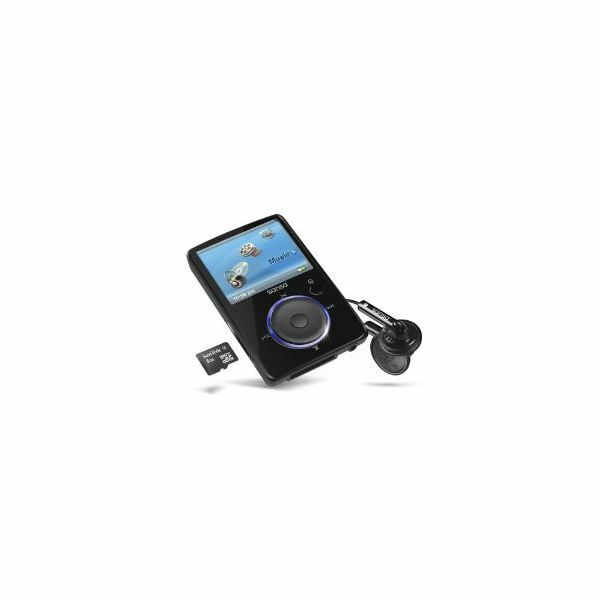 The slotRadio cards enhance a listener's enjoyment by providing quick access to a variety of music genres, such as Rock, Classical, Motown, Hip Hop, Health and Fitness, Country, R&B, Disco and Oldies. Music from single artists such as Michael Jackson, Beyonce, Black Eyed Peas, Keith Urban and others are available on the slotMusic cards ($23.99). 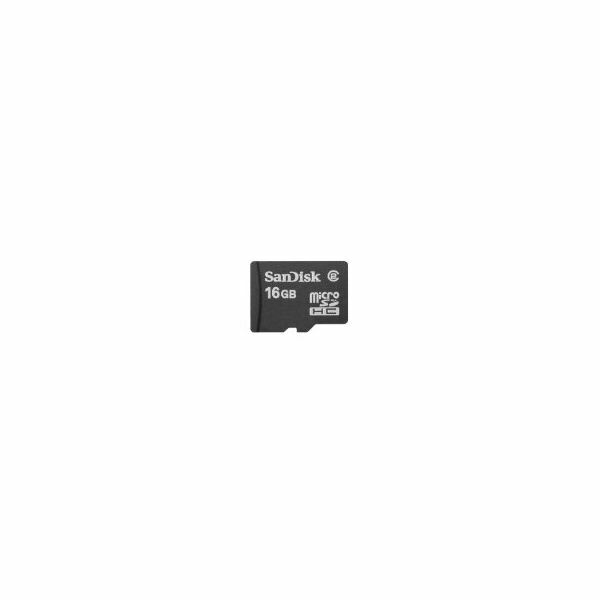 The SanDisk microSDHC™ cards, (available in 4, 8,16 or 32GB) allows the immediate expansion of the Sansa media player's storage capacity and for the easy transport of music, pictures, video, data or files to other compatible devices. Since the Sansa Fuze+ is basically the Sansa View with more bells and whistles, it comes down to six in one hand and half a dozen in the other. For me, I like the thumb wheel feel of the View and Fuze models, however I could easily move up to Fuze+ to get the larger screen and better menu icons. I am not impressed by the Sansa foam covered hard ear buds, which seriously don't fit inside small ears. In addition, the drag and drop music file transfer from Windows Media Player looks much easier than it really is. I found Rhapsody and Nullsoft's Winamp are better for music transfers into the Sansa MP3 players. In short, I recommend the Fuze+ as the best compact MP3 media player for its trim, pocket sized dimensions, innovative menus and device controls but the View for its 32GB plus storage capacity. 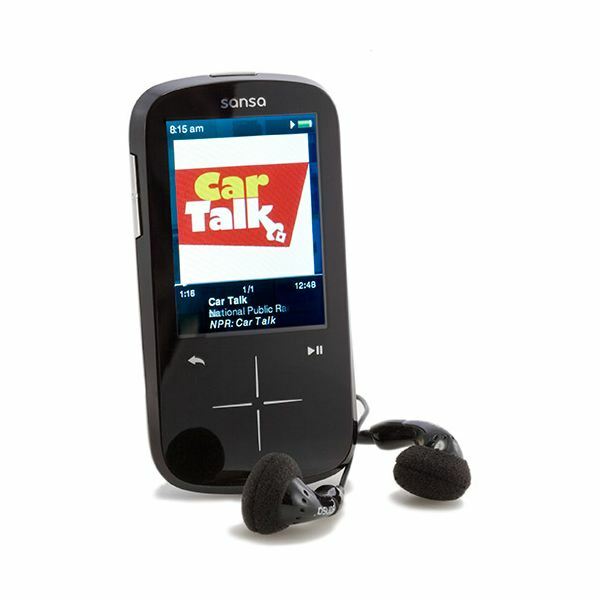 SanDisk MP3 media players come with a limited 1 year warranty.